Experience stunning views of the northern mountains of the Langtang, Himalayas and hike through forests of pine and oak on a 3-day trek of the Kathmandu Valley. Kathmandu 3 Day Trek is a short and scenic trek around Kathmandu. These Kathmandu three day hikes are for every age group and for all seasons. If you want to have a taste of short trekking in Nepal but do not have time to go all the way up to the remote mountains, these hikes around Kathmandu are for you. A Kathmandu 4 Nights / 5 Days Hike, combined with cultural sightseeing tours of heritages sites and a scenic flight to see Mt Everest could make a fantastic short trip of Kathmandu. Chisapani and Nagarkot are both popular mountain-view spots, famous inside and outside the country. These both places offer splendid views of Everest and Langtang ranges, Manaslu, Buddha Himal, Ganesh Himal, Dorje Lakpa Himal and Gauri Shankar Himal among others. 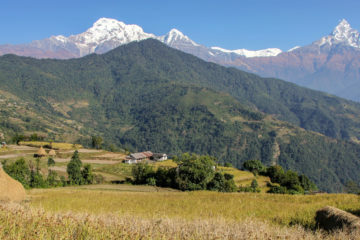 Not only Chisapani Nagarkot trek offer the regal beauty of the Himalayan country from near, but also a chance to explore and experience the ancient tradition, culture, and lifestyle of the rural people, not very far from the city! Kathmandu, Sundarijal, Chisapani & Nagarkot. Day 01: Arrival in Kathmandu (1,350m). Once you land at Tribhuwan International Airport (TIA), Nepal Tours representatives will kindly receive you and take you to your hotel, in a private car or a high-end tourist bus. Nepal Tours representatives will brief you about the trek. After checking in, you can either explore this vibrant and exciting city on your own, or, take a cozy rest at your hotel. Day 02: Drive to Sundarijal and trek to Chisapani (2,135m). We take a short 45-minute drive through the Kathmandu Valley, swiftly leaving the busy streets and organised chaos of the capital behind. We follow the valley floor down a quiet country road to Shivapuri National Park, home to Indian leopards, jungle cats, civets, golden jackals, Himalayan bears, mongoose, deer, wild boars, langur monkeys and the adorable Himalayan pika. Walking here is an absolute pleasure as we follow a cascading river, surrounded by warm tropical forest, wild flowers and culture. Many people live a peaceful existence in the hills overlooking the Kathmandu valley; surviving on self-subsistent farming on the lush hillsides. We’ll continue to climb high through the forest gaining a superb panorama of several Himalayan giants. Drive: 1:30hrs | Walking: 4hrs | Hotel, Breakfast, Lunch, Dinner – Included. Day 03: Trek to Nagarkot (2,175m) via Chaukai Vanjyang. Early morning we will set off to Nagarkot, and the trek will probably be 7 hours long for the day. In the morning, we will observe the beautiful view of the northern mountains and the sunlight dying them red, orange all colors. We will trek through Chauki Bhanjhyang. We will trek uphill and downhill to reach Nagarkot, which is Nepal’s one of the leading tourist destination. On a clear day, we can have a great view of Himalayans stretching all the way from Dhaulagiri in the west to Everest and Kanchenjunga in the west. Walking: 7hrs | Hotel, Breakfast, Lunch – Included. Day 04: Trek down to Changunarayan drive back to Kathmandu. After enjoying the sunset and sunrise from the hilltop of Nagarkot, early morning we will trek down the ancient route to Bhakapur, via the small Newari town of Changunarayan. We will visit Bhaktapur, the most vibrant and preserved medieval town of Nepal, and Bhaktapur Durbar Square, the court of Malla Kings, which is listed in UNESCO’s World Heritage Site. From there, we will drive back to Kathmandu, which will only take 45 minutes at maximum. Walking: 45min | Drive: 45min | Hotel, Breakfast, Dinner – Included. Day 05: Final departure from Kathmandu trip end. The day has come to leave this remarkable country. Our representatives will transfer you to the airport from where you’ll board a flight to your next destination. Bid farewell to this country of Himalayans with plans to visit next time. Because, once is never enough! Lunch and Dinner whilst in Kathmandu & Nagarkot. The Kathmandu based tour agency "Nepal Tours"